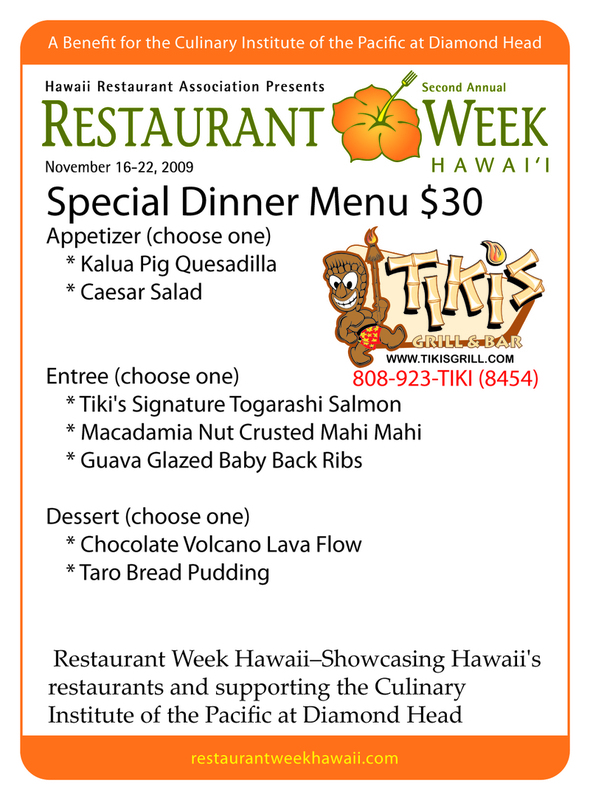 The second annual Restaurant Week Hawaii will be a seven day celebration of the cuisine scene in Hawaii. From fine dining to fast-food, participating restaurants will feature special menu items, promotions and discounts. Diners can sample Hawaii's newest restaurants, dine at old favorites and taste a variety of exceptional dishes now being prepared by Hawaii's chefs using locally grown produce. Restaurant Week is a reminder that Hawaii is a culinary destination with top chefs, farm to table dining, wonderful wine and a lot more to discover and explore. This is the Culinary Institute of the Pacific at Diamond Head. Tiki's "Serve it Up" to The University of California Women Volleyball. 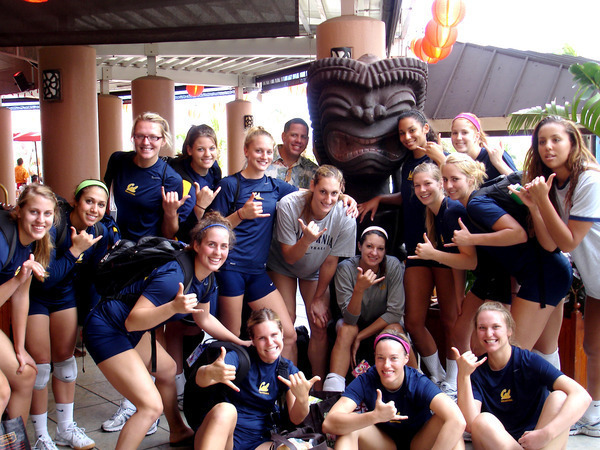 Tiki's Grill & Bar served The University of California Women Volleyball Team. They came in for there pre-game team meal. The team was dressed and ready to play. We were able to have their pre-ordered menu items on the table in 15 minutes. After Lunch the were headed to the Stan Sheriff Center to get ready to play. Mahalo to Jennifer Carey! Bellow is Jennifer Carey. Carey, a former award-winning standout setter at the University of Hawai'i at Manoa. She is now the Director of Volleyball Operations for the Bears. It's always great to see another student athlete move up in a field that they love. In 1999, Carey was the starting setter for the Rainbow Wahine as a freshman where she earned All-Western Athletic Conference second-team honors. She helped lead Hawai'i to a 29-2 record, an NCAA regional semifinal appearance and a No. 8 AVCA final ranking in her first season. In her four-year career, Carey took the Rainbow Wahine to two NCAA national semifinal appearances, two No. 3 rankings, and a 123-12 record. She earned All-WAC second team honors three times and finished her career ranked fourth all-time for Hawai'i with 3,540 assists. Carey was also selected to the WAC All-Academic team in each of her four years with the Rainbow Wahine. Carey's first collegiate match was a 3-0 (15-8, 15-7, 15-5) win against Cal on Sept. 1, 1999, at the Recreational Sports Facility in Berkeley, Calif. She had 33 assists to go along with 12 digs and three kills on five attacks. The match was also the first at Cal for head coach Rich Feller and assistant coach Chris Bigelow. 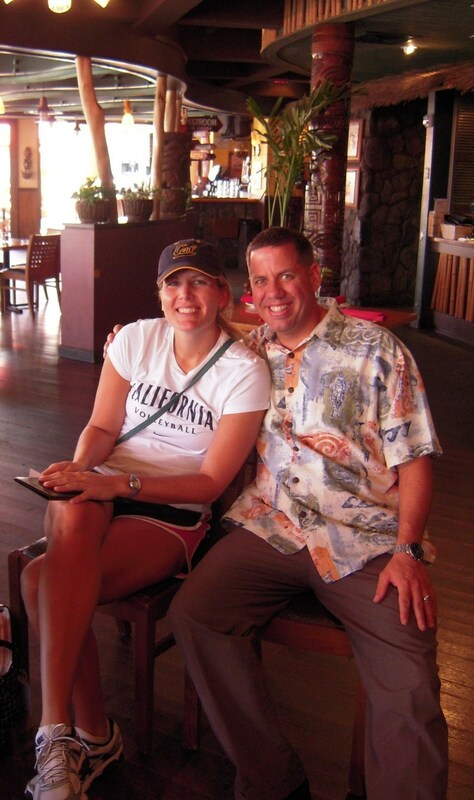 Carey graduated from Hawai'i with a degree in business administration in marketing in 2003. She then worked as a sales and marketing executive for KHNL and K5 Television in Honolulu before leaving the islands to play professionally in the fall of 2004 with Brandenburg VCO in Berlin, Germany. Carey currently resides in Oakland, Calif.
To check out the menu for the team - They ordered off the Pono Menu. Jennifer made me switch the guava cheese cake to plates of fresh fruit. Click on the photo to activate the virtual tour! The Coconut Club is located on the 21st floor high above Waikiki Beach; it is completely private and offers the most sensational view of Waikiki. There is beautiful back drop of Diamond Head and the feeling of having the ocean right in your backyard. The sun begins to set around 6:00pm, and the experience is amazing. If you would like the exact time of the sunset for the day of your event, please let me know. We can provide many selections for your menu, from simple appetizers to extravagant dinner buffets, set menus and desserts. The bar can include a full well, Tiki’s specialty drinks, a large selection of import and domestic beers, and a variety of wines.